Greetings from Hong Kong, guys! Yep, while you are reading this, I am somewhere in Hong Kong, and I am probably either in a business meeting or walking around exploring the city. But this week still will be all about New York. As I just mentioned, we are in Hong Kong for business, and I won’t have the time to update the blog. That’s why I have only two posts this week for you, and both will be about our trip to New York. The big travel guide for New York you all have been waiting for is coming later this week. 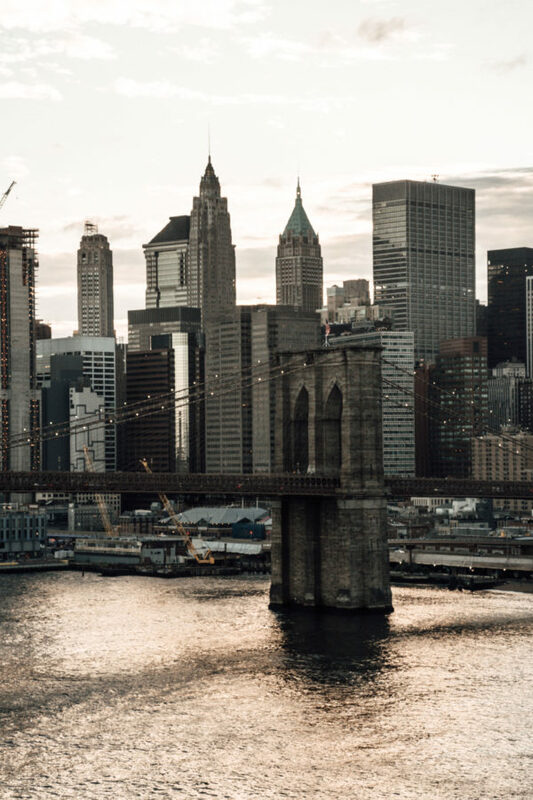 Today I first want to share all the details about one of my favourite places in New York, and I like it so much, it deserves its own post 😉 Dou you want to know what place I am talking about? Continue reading. 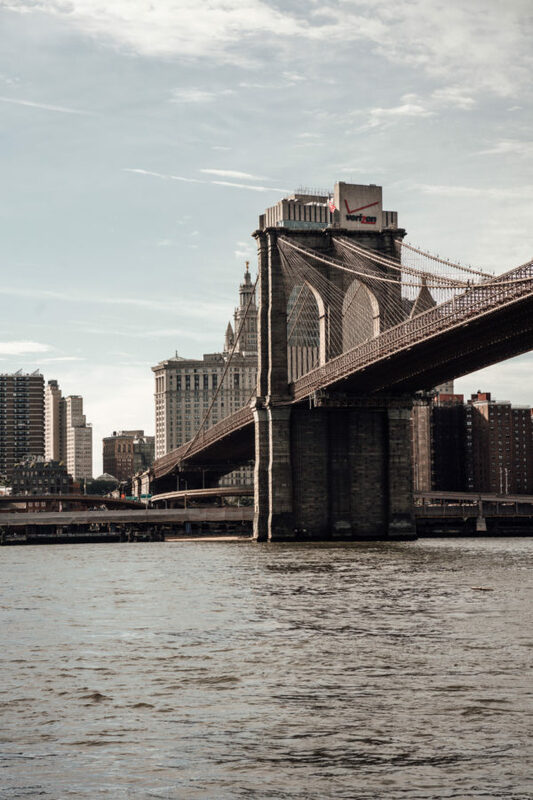 When I was in New York this February, it was my third time in this amazing city, but I did a couple of times for the first time such as walking across Brooklyn Bridge. I had seen several pictures on Instagram and all over the web and was always curious to do it myself and get to enjoy this amazing view. It was on top of the list of the things we wanted to do in New York back in February and so was it this time, about six months later. And guess what? I would do it again. I actually think it’s something you should do whenever visiting New York. Yes, it gets quite busy on the bridge, and yes, it probably is a very touristy thing to do. But who cares when getting to enjoy one of the best views of the big apple? Also, you can choose the time you walk across the bridge wisely. I would suggest the early morning as this is probably the time it’s at least crowded on the bridge. If you just want to walk across the bridge and take some pictures of the skyline, you can go whenever you want. Because there are plenty of great spots, you can do it. But if you want a picture of you walking across the bridge, the morning might be a better choice. There are some spots you will get great shots without any other people in the background, but you won’t get a picture of the bridge. 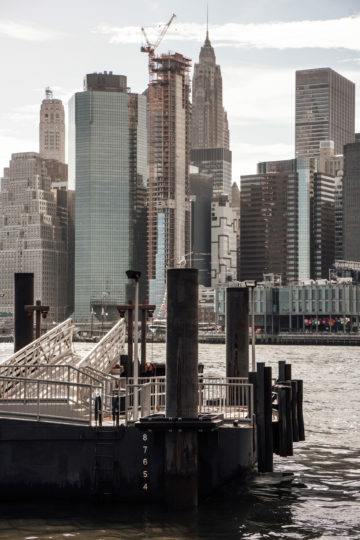 Also, I would suggest starting walking from Brooklyn Bridge and take the picture there as most tourists begin in Manhatten and take all the pictures there. In Brooklyn, it might be less crowded, AND you get the full Manhatten view. To get that wrong: Brooklyn Bridge is not only a great photo location. I would also walk it and not take any pictures, but it would be hard to resist. 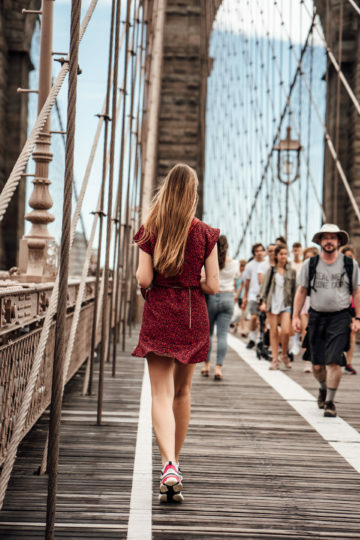 😉 So to sum everything up: walking across Brooklyn Bridge is always a good idea. No matter, if you want to take pictures, just enjoy the view or move yourself a little bit and get from Manhatten to Brooklyn or the other way around. Brooklyn Bridge or Manhattan Bridge? Next, to Brooklyn Bridge, you will find Manhattan Bridge. It’s not as beautiful as Brooklyn Bridge, but definitely worth walking across as you do not only get a great view of Manhatten but also the Brooklyn Bridge in front of the skyline. We walked across Brooklyn Bridge from Manhatten to Brooklyn and across Manhattan Bridge to get back to Manhatten from Brooklyn. That’s something I definitely would recommend. You can’t take any beautiful pictures of yourself on Manhattan Bridge and it is quite noisy due to the train, but you get to enjoy the view of the skyline and Brooklyn Bridge in front of it.